Nashville, TN – There may only be eighteen tables at “Larry’s Country Diner,” but it serves 1.4 million people each and every month as one of the top-rated shows on the RFD-TV network. 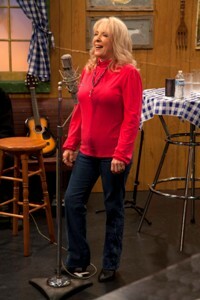 The diner is not your ordinary restaurant, but rather a unique down-home variety show that in just over two short years has become a favorite “eatery” of country fans everywhere. Cornbread and black-eyed peas only complement the heapin’ helpin’ of country music performances served up by the stars of yesterday and today. As the show prepares to produce its 100th episode, the show continues to amass fans and garner attention (with recent articles inBillboard magazine, American Profile and even a tweet from new fan and TV personality, Drew Carey) -- proving that America is “hungry” for this type of programming. PFI (America’s Western Store), Crosley Radio (vintage-style radio and jukebox manufacturer) and Col. Littleton (purveyor of fine accouterments in the American Tradition)are on-going sponsors of the show. For more information on “Larry’s Country Diner,” please visit larryscountrydiner.com. Air times for “Larry’s Country Diner” are Thursday night at 7 PM CST / 8 PM EST, Friday morning at 9 AM CST/10 AM EST, or Saturday evening at 10 PM CST / 11 PM EST. Because of its popularity, getting a seat to see a live taping might prove more difficult than getting a reservation at one of L.A.’s most trendy posh restaurants—the first available table is not available until 2013, so you’ll want to plan way in advance. For reservations, please call 615-673-2846 or email paula@gabrielcommunications.com. 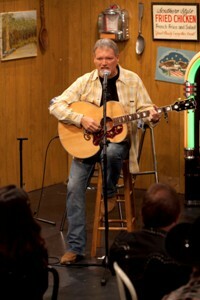 Larry’s Country Diner is a unique down-home variety show which integrates entertainment, interviews and music in a weekly format, taped LIVE in front of a studio audience in a country diner setting. The show features regular characters including Black, Keith Bilbrey, Sheriff Jimmy Capps, waitress Renae and avid church lady Nadine, along with special guest appearances by country music artists of yesterday and today. Since its initial airing on August 3, 2009, Larry’s Country Diner has produced nearly 100 episodes and has become one of the most popular shows on RFD-TV, garnering 1.4 million viewers monthly. For more information, please visitwww.larryscountrydiner.com. Larry’s Country Diner is another product of Gabriel Communications, started in 1996. Owned and operated by long-time disc jockey, Larry Black, the company specializes in “Reunion Videos.” The success of this series spurred the creation of more than a dozen more projects featuring hundreds of songs and stories as well as Country’s Family Reunion News, a monthly newspaper which highlights the music of yesteryear. For more information on Country Family Reunion products, please visit: www.cfrvideos.com.